Bath time can be adventure time. Where else can a boy have fun with whales, dolphins, pelicans, and their friends? About Ginger Nielsen (Illustrator) : Ginger Nielsen is a published illustrator. 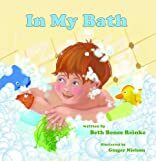 A published credit of Ginger Nielsen is In My Bath.